Prospective car buyers entering the market for their next vehicle have a lot of decisions to make before they can drive away in their new car. Our team here at Certified Autoplex is working to alleviate some of the pressures that come with finding a new vehicle by providing detailed research information that can be used to narrow down your options. Here at Certified Autoplex, we carry only pre-owned vehicles. Most of our inventory is luxury-based, but we do carry a variety of mainstream brands as well. This time around we’re going to focus on a brand that’s often forgotten about in the shades of more popular brands. However, even if it’s not the most popular, the models are definitely unique and memorable. We’re talking about MINI, which is the brand with the classic MINI Cooper. Believe it or not, there are a variety of models available, which are variations of the most recognizable one. Although we don’t have a ton of options to choose from, drivers in the Dallas area are sure to find the MINI they’re looking for here at Certified Autoplex. On average, we have about 300 pre-owned vehicles for drivers to choose from at any given time. It’s important for us to note that our inventory is constantly changing, but as of right now we have five MINI models to choose from. All of the models are from 2013, but again that is all subject to change at any time. There are a few different choices when it comes to the interesting MINI lineup. Drivers will be able to pick from the classic MINI Cooper in either a two- or four-door model. These both come with hardtops, but there is also a convertible model available as well. 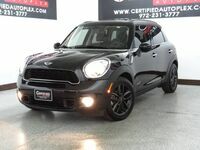 The other two models are the MINI Cooper Countryman and the MINI Cooper Clubman. The Countryman is considered a compact SUV, whereas the Clubman is is more of a hatchback design. All MINI models offer seating for up to five passengers. Drivers interested in learning more about the available MINI lineup are welcome to contact our team here at Certified Autoplex for more information. Those looking to get behind the wheel can do so by scheduling a test drive online today. Interested in a Used MINI Cooper Models?